In the spring of 1928 James Mackintosh Bell, consulting geologist for the Atlas Exploration Group, invited his friends Alexander Young (A.Y.) Jackson and Dr. Frederick Banting to accompany him on a summer trip into the Northwest Territories. Their destination was a prospecting camp on Prosperous Lake approximately 15 kilometers north ofYellowknife (see map). Bell wanted Jackson and Banting to see for themselves, and to paint, the beauty of the country around Great Slave Lake. A.Y. Jackson – one of Canada’s most famous artists and a member of the Group of Seven – often accepted invitations to travel to remote corners of Canada to paint landscapes. 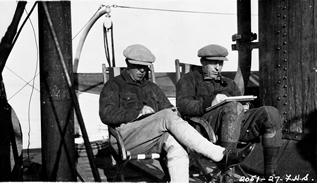 One such trip was in 1927 when he travelled with Dr Frederick Banting , co-discoverer of insulin and a talented amateur landscape painter, to the eastern Arctic on the Royal Canadian Mounted Police supply ship Beothic. After this successful painting trip to the eastern Arctic neither Jackson nor Banting hesitated to accept Bell’s invitation to visit the Great Slave Lake area. In late June 1928 Banting, Jackson and Bell travelled by rail to Waterways, Alberta, near Fort McMurray, where they boarded a Hudson’s Bay Company boat for its trip down the Athabasca and Slave rivers. At each of the trading posts visited by the boat they discovered people sick with the influenza virus. On July 9th, when they arrived at Fort Resolution, Banting made a note in his diary about how fast the flu seemed to be spreading and speculated that perhaps the ever-present mosquito was to blame. As a medical doctor he was asked to treat the sick and he did what he could to help. Fort Resolution had yet to see any deaths from this influenza outbreak but word from further north wasn’t so good. The virus had struck both Fort Rae and the Yellowknife Indian Village (now Detah) and the most vulnerable among the mostly Tåîchô Dene population were dying. It was under this looming threat of a territory wide epidemic that A.Y. Jackson and Frederick Banting set about doing what they’d come north to do, paint. Both artists produced paintings of buildings, people and traditional activities in and around Fort Resolution before crossing Great Slave Lake. As they approached Yellowknife Bay they met Tåîchô Dene who were fleeing the area. Twelve of their people had already succumbed to the flu and the rest of the village had fled into the bush in a futile attempt to avoid catching the disease. There was little Jackson and Banting could do but continue on to Prosperous Lake. When Jackson and Banting returned to Fort Resolution on July 24th they found that the flu had taken the lives of 24 Dene in that community and many more were ill, again Dr. Banting did what he could to help. It was Dr. Banting who came to the realization that crew or passengers onboard the Hudson’s Bay Company paddle wheeler SS Distributor were responsible for spreading the influenza virus down the Slave and Mackenzie rivers, a virus that over the summer and autumn of 1928 devastated the Aboriginal population of the north. Paintings produced in 1928 by A.Y. Jackson and Dr. Frederick Banting grace the walls of art galleries and private collections throughout the world.